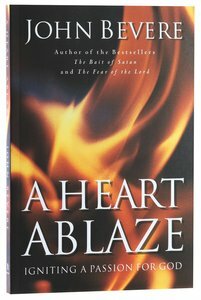 Customer Reviews For "A Heart Ablaze"
John Bevere has written a lot of books, but I think this is his best. It offers foundational teaching every Christian needs to read, digest, study, ponder and incorporate into their faith walk. John teaches thoroughly, with many, many scriptures to back up every thought, and with plenty of true life stories to keep it relatable and real. He challenges the reader to desire above all else a relationship with God, to set your heart ablaze for God. He encourages and gives practical guidance as to how to climb the mountain to God Himself, as Moses did, rather than settling for remaining at the foot of the mountain like the Israelites. I would highly recommend reading it in conjunction with the curriculum John has put out - adds even more depth.